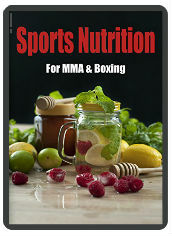 More and more popular with MMA fighters and athletes in general. Raw vegan diets are nutritionally dense and delicious if done correctly. Hemp seeds and quinoa are great sources of essential amino acids and protein. Raw Vegan Protein Powder or a Smoothie would be ideal after and possibly before a training session. Diluted fruit juice with a pinch of pink salt makes a good sports drink for during training.